As an aspiring blues guitarist it is really important to create a 'bag of tricks' filled with guitar licks. When listening to the best blues guitarists you'll notice that there are several famous licks they use all of the time. This is the reason why the collection of these famous licks is a crucial aspect in your own development as a guitarist. All great blues master guitarists use them in their own solos, so neglecting this aspect is a huge loss for anyone who tries to play blues guitar. The blues consists out of a lot of famous guitar licks that were transferred from one guitarist to another. Initially this transfer happened by ear but nowadays a lot of people rely on tablature. Tablature is therefore a very useful tool, nevertheless that learning licks purely from tab makes no sense at all. It is important to know where the lick comes from so you can use the lick in every musical situation. The first blues lick to learn on guitar is derived from the famous master blues guitarist Freddy King. Listen to his song 'Hide Away' and you will clearly notice the lick that is analysed below. The blues lick below seems very easy at first but should not be underestimated rhythmically. It’s important that you don’t start the lick right away on the first beat because it is syncopated. This simply means that the accent lays in between the beats and you have to start the lick at the upbeat from beat one. In beat two you have to make use of a triplet rhythm so you play three notes here. Combining binary and ternary rhythms is one of the skills that will enrich your phrasing skills remarkably. The technicality of this blues lick is not of the most difficult nature. The techniques required to play the lick are simply a hammer-on and vibrato technique. It’s also a great idea to leave the guitar pick out once in a while and play with the fingers only. By doing so you can make use of other types of dynamics into your guitar playing which aren't otherwise possible. Take a look at the video to get a clear hang of the sound of this guitar lick. When taking a closer look at the construction of the entire lick, you’ll notice that the last note will significantly turn the beautiful major sound of the lick into a more bluesy minor feel. This shouldn't come as a suprise, as this last note is derived from the minor scale instead of the previous notes from the major scale. This second blues lick sounds very tasty due to the use of double stops. A double stop technique simply means that there are two notes on adjacent strings played at the same time. This specific double stop is a must to learn for every guitarist who wants to play blues as it is literally the most used double stop in the whole blues scene. Make sure to take a look at the video so you know how this second blues lick sound. When you learn licks, it is always very important that you don’t fall in the trap of just copying licks. You must gain the knowledge of the scale where the lick is derived from. If not, you will end up using the lick in a wrong context. For example, playing these licks in a minor blues setting will end very bad. The two blues licks we analysed in this article are on the other hand perfect to use over dominant seven chords such as the ones used in a standard 12 bar blues. Once your bag of guitar tricks is filled with these two very famous and important blues licks, it is essential that you start using them in a musical situation such as an improvisation. If you listen to blues music you will notice that a lot of classic blues licks return all the time, not as separate licks but they are combined into one bigger lick. Take a listen for example to the style of Stevie Ray Vaughan who’s constantly using short cliché blues licks that are glued together to make it really big and powerful. To give you an idea on how this method works, I’ll show you how to combine the two blues licks that we covered in this article. You’ll notice that playing both licks after each other won’t sound that great. In this case you have to use a ‘glue’ in the form of extra notes to create a good end result. On the tablature above you’ll notice both blues lick 1 and blues lick 2 that are merged together. The only addition to the two licks is the note that is indicated with the blue circle. This note is the high e string and also the root note of the E minor and the E major pentatonic scale, which makes it perfect to use as a glue to form one compelling blues lick out of the two smaller licks. While learning blues guitar licks is an important step to take, you'll need more than this. You need to know exactly how to play each lick over any chord. Playing the exact right notes at the exact right time so they fit the underlying chords is a very important skill. A lot of blues guitar students make the mistake thinking that they can just transpose licks to play over any chord, but this just sounds horribly wrong. 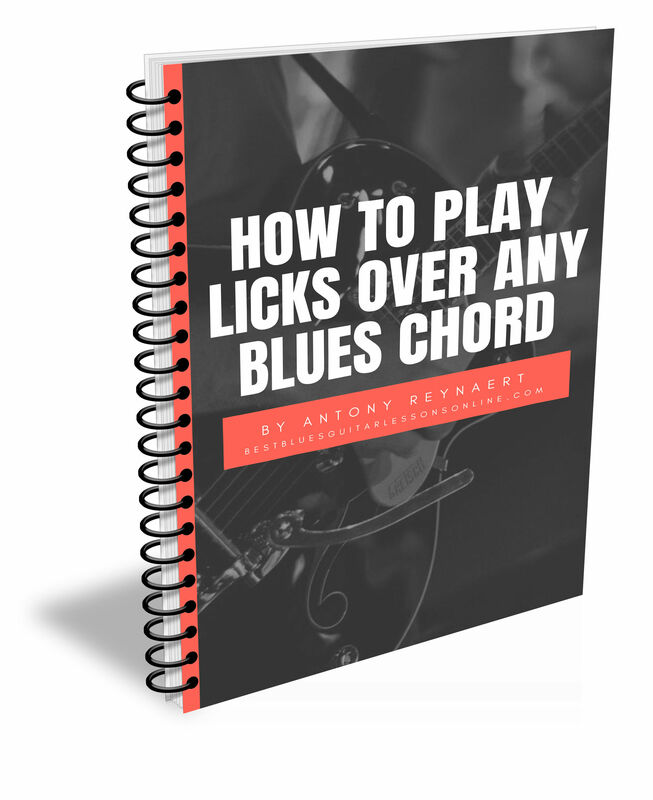 In this free downloadable ebook on How To Play Licks Over Any Blues Chord you’ll learn exactly what to do when improvising over blues chords.